Walsh attended Cardinal Gibbons High School in Fort Lauderdale, Florida, and played football for coach Michael Morill as their punter and placekicker. As a senior, he made 14 of 20 field goal attempts and 30 of 31 extra point attempts. Twice he hit field goals from 59 yards. Walsh also averaged 41 yards per punt and 69 yards per kickoff. For his efforts, he was named to USA Today's All-USA First Team Offense and noted as a top-5 kicker in the nation by ESPN.com. 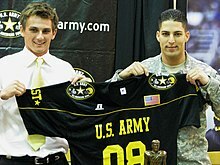 He also played in the 2008 U.S. Army All-American Bowl. Walsh attended the University of Georgia, where he was a placekicker for coach Mark Richt's Georgia Bulldogs football team from 2008 to 2011. He was a standout player who amassed a number of significant kicking statistics for which he became known as the "Athens Assassin". During his time at Georgia, he made 4 field goals in a game three times. Twice he attempted a field goal from his long, 56 yards, and converted it once in a game against Coastal Carolina in his senior year. In all, Walsh made 184 of 185 PATs and 76 of 103 field goals. However, in his senior year, he made just 21 of 35 field goal attempts. He also had two tackles and one fumble recovery to his credit. Walsh was drafted by the Minnesota Vikings with the fifth pick of the sixth round of the 2012 NFL Draft. A priority acquisition for the Vikings, Walsh would take over kicking duties for the released Ryan Longwell. Through the first 11 weeks of the season, Walsh missed only one field goal and had another blocked. He was 6-for-6 with kicks over 50 yards and 21-for-21 on extra point attempts. On December 16, Walsh passed Randy Moss for the Vikings' franchise record in points scored by a rookie (119). In his best week of his rookie season, in a game against the St. Louis Rams in week 15, Walsh equalled the NFL record for field goals made from 50 yards or more with his eighth kick (a new team record); his three 50-yarders in the game was also a team record. His 5 kicks also tied an NFL record for most field goals of 37 yards or more in a single game, 5, which only Chris Boniol equaled for the Cowboys in 1996 and Scott Norwood in 1988. The next week in a game against the Houston Texans on December 23, 2012, Walsh completed a 56-yard attempt, setting the NFL record for field goals over 50 yards in a season with his 9th 50+ yarder. The 56 yarder also tied the Vikings record of longest field goal set by Paul Edinger in 2005. Walsh speaks with the media after a game-winner against the Packers. In the final game of the 2012 season, Walsh completed a 54-yard field goal to make himself 10/10 over 50 yards on the season. He was 3 points short of tying an NFL record for most points in a season by a rookie at 144, Walsh ended 2012 with 141 points for the Vikings; which is the team record. His final regular season field goal allowed the Vikings to beat the Green Bay Packers 37-34 and earn a playoff berth. The field goal also tied the NFL record for most field goals by a rookie kicker at 35 with Ali Haji-Sheikh from 1983. In the 2013 season opener against the Detroit Lions, Walsh tied the record for most consecutive 50 yard or more field goals with eleven, tying with Robbie Gould and Tony Zendejas. Walsh broke the record three weeks later against the Pittsburgh Steelers in London, England with his twelfth straight 50+ yard field goal. On November 24 against the Green Bay Packers Walsh hit four of four field goals and had five touchbacks off kickoffs; he was named NFC special teams player of the week. In July, Walsh signed a four-year contract extension worth up to $14 million, including $5.25 million guaranteed, making him one of the top-five highest-paid kickers in the NFL. He struggled in the preseason, making only five of eleven field goal attempts. Walsh missed a 36-yard field goal attempt in a 20–23 loss to the Denver Broncos in week 4. He picked himself up by converting seventeen consecutive field goals from week 4 in Denver through week 10 in Oakland, where he missed a 53-yarder that ended his streak. During this span, Walsh kicked back-to-back game-winning field goals: a 36-yarder against the Chicago Bears in week 8 and a 40-yarder in week 9 against the St. Louis Rams in overtime. Walsh has made five out of five field goal attempts on two separate occasions: week 7 against the Detroit Lions and week 16 against the New York Giants, including two 50+ yard field goals in each. For his efforts after scoring 19 points in Minnesota's 49–17 win over the Giants, Walsh was named NFC Special Teams Player of the Week. 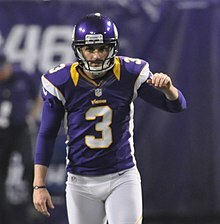 In the Vikings' 20–13 win over the Green Bay Packers in week 17, Walsh converted both of his field goal attempts, giving him a total of 34 made field goals, the most among kickers in the 2015 NFL season. In the Vikings' first playoff game since 2012 against the Seattle Seahawks on January 10, 2016, in a game played in Arctic conditions, Walsh was 3-for-3 on field goals before missing a potentially game-winning 27-yard attempt in the 4th quarter with 26 seconds remaining. Walsh kicked the laces of the football and hooked the attempt wide left, and the Vikings lost the game by a score of 10–9. Walsh struggled through the first ten weeks of the 2016 season, missing four extra points along with four field goal attempts. He missed an extra point in a 26–20 Week 10 loss to the Washington Redskins which led to his release from the Vikings on November 15, 2016. After his release from Minnesota, on February 9, 2017, Walsh signed with the Seattle Seahawks. He gained national attention during his second preseason game where the Seahawks beat the Minnesota Vikings, his former team, 20–13. He went 2-of-3 on field goals of over 50 yards and converted both extra point attempts during the game. After his two successful field goals, he was seen pointing at Vikings head coach Mike Zimmer and his former Viking teammates for being taunted and having profanity yelled at him during all of his extra points and field goals. At one point, Richard Sherman joined in to show his support and respect for his new teammate. On September 10, 2017, in the season opening 17–9 loss to the Green Bay Packers, Walsh converted three field goals in his Seahawks debut. On November 5, 2017, Walsh was 12 of 13 on field goals and 16 of 17 on extra points before the game against the Washington Redskins where Walsh missed three field goals in the first half. On November 9, 2017, in a Thursday Night Football game 4 days later Walsh made 2 field goals and 2 extra points in a 22-16 win against the Arizona Cardinals. On November 20, 2017, in a Monday Night Football game against the Atlanta Falcons, Walsh made 3 field goals before coming up a foot short on 52 yard game-tying field goal with 2 seconds left, and Seattle fell short in their comeback, 34-31. On December 3, 2017, in Sunday Night Football game against the 10-1 Philadelphia Eagles, Walsh made a 46-yard field goal on the Seahawk's opening drive to make it 3-0 and made 3 extra points in a 24-10 win against the Eagles that pushed the Seahawks to 8-4 in the season. On December 31, 2017, as the Seahawks were playing for a spot in the Playoffs against the Arizona Cardinals, Walsh made a 49-yard field goal early in the fourth quarter. With less than a minute remaining, Walsh missed a field goal that would have clinched the game with a 27-26 victory. Blair Walsh kicks a field goal in the 2013 Pro Bowl. Due to Walsh's unsatisfactory performance in the 2017 NFL season, the Seahawks signed former Jacksonville Jaguars place kicker Jason Myers. The Seattle Times said, "The signing of Myers could be the first step in Seattle reshaping its kicking units in 2018." ^ Zurowski, Cody (September 24, 2015). "Instead of a lynching, maybe Blair Walsh should just stop looking down". citypages.com. Retrieved December 5, 2017. ^ Craig, Mark (December 16, 2012). "Long field goals put rookie kicker in record books". Star Tribune. Minneapolis: Star Tribune. Retrieved December 18, 2012. ^ Mayer, Larry (September 8, 2013). "Bennett rebounds from drop with impressive TD". Chicago Bears. Archived from the original on September 11, 2013. Retrieved September 8, 2013. Gould has now made 11 straight field goals from 50 yards and beyond, tying the NFL record set by Tony Zendejas from 1988 to 1993. The Vikings' Blair Walsh also tied the mark Sunday. ^ Goessling, Ben (July 26, 2015). 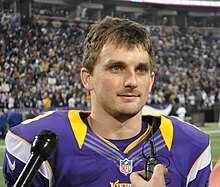 "Kicker Blair Walsh gets contract extension from Vikings". ESPN. Retrieved December 29, 2015. ^ Vensel, Matt (December 30, 2015). "Blair Walsh named NFC Special Teams Player of the Week". Star Tribune. Retrieved December 30, 2015. ^ Edholm, Eric (January 10, 2016). "Blair Walsh hooks short field goal; Seahawks survive vs. Vikings". Yahoo! Sports. Retrieved January 10, 2016. ^ "Vikings K Blair Walsh misses potential game-winning 27-yard FG". Sports Illustrated. January 10, 2016. Retrieved January 10, 2016. ^ "Vikings Release K Blair Walsh". Vikings.com. November 15, 2016. ^ Sessler, Marc (November 15, 2016). "Minnesota Vikings release kicker Blair Walsh". NFL.com. ^ Drovetto, Tony (February 9, 2017). "Seahawks Sign Kicker Blair Walsh". Seahawks.com. Archived from the original on February 15, 2017. Retrieved February 9, 2017. ^ DiNitto, Marcus (August 19, 2017). "Blair Walsh, ex-Vikings teammates exchange taunts during game". sportingnews.com. Retrieved December 31, 2017. ^ "Seattle Seahawks at Green Bay Packers - September 10th, 2017". Pro-Football-Reference.com. Retrieved September 14, 2017. ^ Henderson, Brady (November 6, 2017). "Pete Carroll on Blair Walsh's missed FGs: 'I'm disappointed for him'". ESPN.com. Retrieved March 12, 2018. ^ "Seahawks sign K Jason Myers, a potential replacement for Blair Walsh". ESPN.com. Retrieved March 15, 2018. ^ "Seahawks sign kicker Jason Myers as replacement candidate for Blair Walsh". The Seattle Times. January 3, 2018. Retrieved March 15, 2018. ^ Mountford, Michael (January 2014). "2014 PFF ALL-NFC NORTH TEAM". ProFootballFocus.com. Pro Football Focus. ^ Preston, Michael (December 16, 2012). "Minnesota Vikings rookie K Blair Walsh passes Randy Moss' record". SB Nation. Retrieved January 4, 2013.